Dry conditions — Dry fingertips are common, caused by anything from climate conditions or natural skin characteristics to frequent hand-washing or air travel. Multispectral imaging technology captures high-quality images even when fingers are dry. Wet conditions — Moisture is a fairly common real world condition. Some environments are naturally damp, due to climate (London) or setting (a spa). Some people have moist hands. Multispectral imaging technology captures high-quality images even in wet conditions. Diverse demographics — Biometrics work because people are unique — and yet diverse user populations are difficult for many fingerprint biometrics systems to handle. Multispectral imaging can authenticate anyone, no matter what their age, ethnicity, job or lifestyle. Rugged conditions — People don’t have time to wash and lotion their hands when they use a fingerprint sensor. And yet other technologies require just that to meet performance requirements. Multispectral sensors take people as they are — at the office, construction site, or agricultural field. A variety of materials and methods, from the inexpensive to the very sophisticated, can be used to circumvent traditional fingerprint identification systems. Called “spoofs”, some of these fake fingerprints are so thin and colorless that they can even be used, undetected, in access control environments that have trained attendants. 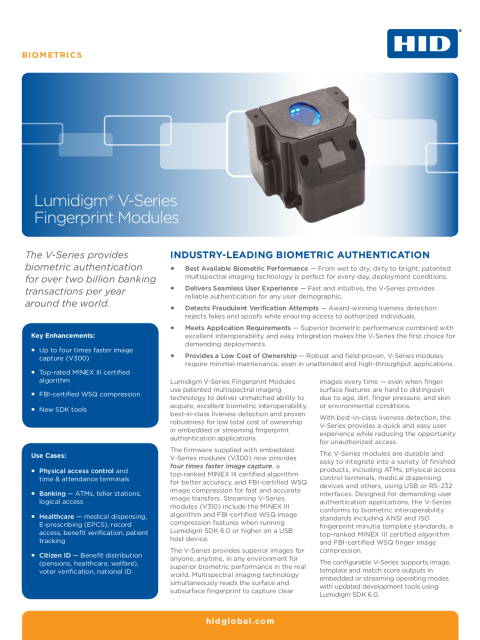 Lumidigm® V-Series sensors and modules have patent-protected liveness detection capability that looks beyond the surface of the skin and can discriminate between the features of live skin and copies of fingerprint features in a fraction of a second. Multispectral imaging goes beyond conventional, contact-oriented measurements to deliver not only superior real world biometric performance but the best liveness detection capability in the industry. It provides protection from published and unpublished methods of producing and using finger copies that will defeat conventional fingerprint sensors. Lumidigm’s liveness detection is built from cutting-edge machine learning algorithms and can be updated as new spoofs are identified. Unlike any other fingerprint technology, this “learning” capability allows Lumidigm fingerprint sensors to keep up with new threats. It is important to note that all the published literature on making finger copies and testing spoof protection is based on copies that are made with a cooperative subject. While collecting a latent print from an uncooperative subject is certainly possible, creating a copy of such a print that is of a high enough quality to match the subject’s print and defeat liveness detection is very difficult. A database has been breached and biometric data is "in the wild". What can be done to render biometric data useless to an impostor? Understand why Lumidigm technology is less susceptible to well-known spoof attacks.